1) First melt the butter in a pan on a low heat. Add the marshmallows stirring until everything becomes a thick liquid or warm butter and marshmallows in microwave until melted. 2) When hot pour into bowl of Rice Krispies and mix (add more if required). 3) Then pour the mixture into a baking tray (greased or lined with baking paper) and keep in fridge until hard and ready to eat. 4) Cut it up into bite-sized pieces then serve. This is a family secret recipe until now and is quick and easy for kids to make whilst not knowing they're learning important life skills. This recipe shows that preparing something for a bake sale is easy as 123. Its also an idea that the kids will enjoy making.... and eating! 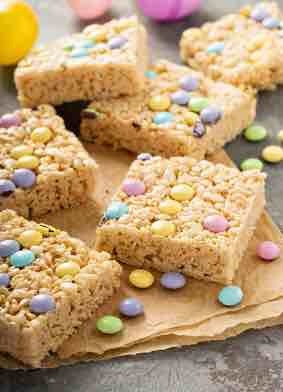 There are lots of ideas on the web for little additions such as adding toffee, vanilla or as in the picture above popping a few Smartie type sweets on top of the Krispies before they cool for an extra scrummy twist.